Hi folks. I have only just managed to get internet access again. The tour agent was kind enough to lend me his laptop as the Wifi feature of my Iphone doesn't work anymore. As you know I am in Merzouga and came here to do some heat acclimatisation and sand dune running. True to my aim I have been out running in the dunes every single day. The first day, which I already covered in my previous post, I ran 4.9km in the dunes. That was the 23rd of March. On the 24th of March I ran 10.61km in the dunes and then later in the day I ran another 10km on stony ground. On the 25th March I ran 10km in the dunes and then walked for 3km in the dunes. Finally today I managed to run 15km in the dunes and then I walked for 1.64km in the dunes. As you can see from the above, I have been building up the distances gradually. Each day I have tried to go out running during the hottest part of the day to get some heat acclimatisation. The first couple of days it was not that hot, but thankfully yesterday and today it was pretty hot. That is probably the reason why I had a headache and felt nauseous after my runs yesterday and today. 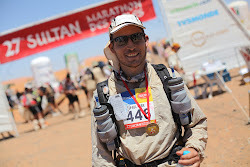 I drank the same amount of water that I will be supplied with during the MDS i.e. 1.5 litres every 10km, so it does worry me slightly that I am going to have a constant headache throughout the MDS. I am hoping that as my body gets used to the heat more, the headaches will cease. Running in the sand as you can imagine is pretty tough. That is another reason for building up the distance that I run in the dunes gradually. Your ankles and knees twist and turn in all kinds of directions, and you can never predict when the sand will give way underfoot, and in which direction it will give way. When you are running fast down the dunes you have to be careful not to hyperextend your knee when the sand goes from soft to hard and you don't get the foot sinking that you had anticipated. In terms of speed I have realised that dune running is pretty slow. I have been averaging around 5 or 6km/h at best. It obviously depends on how hard or soft the sand is, and how much up and down you have to do to get from A to B. Here in the dunes of Merzouga there is no way to get from A to B without going constantly up and down, and some of the dunes are 150 metres high. A flat route simply does not exist. When I gave my average speed above, that is a pace that I can maintain with some degree of comfort. I am sure I could cover more ground per hour if I was actually racing. I want to try to get to the stage where I am running 21km in the dunes during the hottest part of the day. Once I achieve that I will not try to increase the distance any further, as we are within 2 weeks of the start of the MDS and I should be starting to taper for the race. The optimum amount of time performing moderate exercise in the heat to achieve good heat acclimatisation is 100 minutes according to the research I was reading. Any more than that and you do not get any additional gain. Incredible efforts Paul, keep it up! Thanks Jon. After looking up more on sand running and how tough it is on the joints though I have decided 21km a day in dunes may be a bit too much a week and a half before the race. I am going to do 1 hour a day in the dunes followed by 40 minutes on the stony ground. That will give me the optimal 100 minutes a day of heat acclimatisation without tiring me out too much. I can follow that with a sauna session in the evening at the hotel down the road that has a spa.